For the ultimate intensity, reach for the amazing Vegas Nay Lashes by Eylure in style Fiercely Fabulous. The incredibly dense lash strands vary in length for a textured appearance, flaring outwards for a voluminous, curled finish. Eylure's The Vegas Nay Gorgeous Edit Lash Set is full, fluffy and absolutely fabulous! Ideal for every occasion, you'll be absolutely show-stopping in these beauties. Each lash is unique, handmade and reusable. Super-easy to apply, gentle to remove. Eylure X Vegas Nay brings you a little gold lash beauty you'll be dying to get your hands on. Perfect for the festive season, the Vegas Nay Gorgeous Edit homes three spectacular pairs of beautifully curated lashes. Grand Glamor: an alluring lash for full-on glamor, make a statement in the beautiful style - The Vegas Nay Gorgeous Edit Lash Se. Vegas Nay Eyelash Adhesive is a brand new waterproof lash GLUE with clear finish as a complement to the 1ml glue in each pack of Vegas Nay False Lashes. They are perfect for lash lovers. Vegas Nay Absolute Allure False Lashes by Eylure are part of the Vegas Nay x Eylure Collection. These Mink Effect lashes add length in wispy sections. All the Eylure x Vegas Nay Mink effect lashes are full, fluffy and fabulous. Vegas Nay Classic Charm False Lashes by Eylure is a delicate looking, shorter length black lash for a perfectly beautiful finish. The Vegas Nay by Eylure Collection is a Gorgeous jewel-toned packaging enhanced with gold, a perfect reflection of her flawless profile. This collection features four 100% natural hair, lightweight lashes each with a back of pack that is individually tailored to show exactly what the lashes can do. 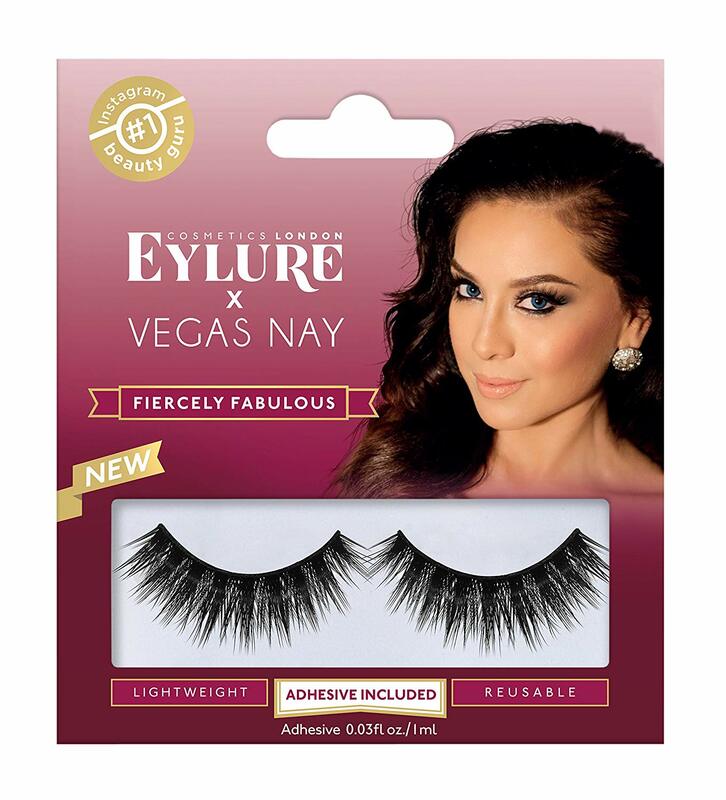 Vegas Nay Easy Elegance False Lashes by Eylure is an elegant, textured lash with tighly knitted lash bundles with a kick at the outer corner; this style will elongate the eye beautifully. The Vegas Nay by Eylure Collection is a Gorgeous jewel-toned packaging enhanced with gold, a perfect reflection of her flawless profile. This collection features four 100% natural hair, lightweight lashes each with a back of pack that is individually tailored to show exactly what the lashes can do. Vegas Nay Grand Glamor False Lashes by Eylure is an alluring and original lash for full-on glamour, make a statement in this beautiful style. The Vegas Nay by Eylure Collection is a Gorgeous jewel-toned packaging enhanced with gold, a perfect reflection of her flawless profile. This collection features four 100% natural hair, lightweight lashes each with a back of pack that is individually tailored to show exactly what the lashes can do. 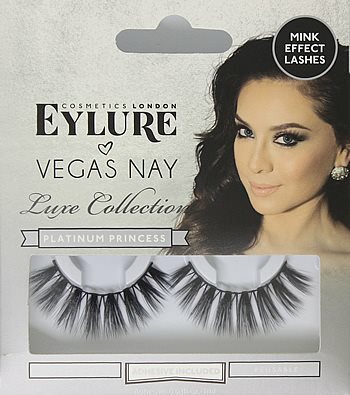 Vegas Nay Luxe Collection Platinum Princess False Lashes by Eylure are part of the Vegas Nay Luxe Collection. These alluring Mink Effect lashes are full, fluffy and fabulously luxurious. This royally beautiful lash style features wispy lashes handcrafted in discrete sections. Vegas Nay Pretty Perfect Individual Lashes (also known as Absolute Allure Lashes) by Eylure is a Semi-permanent, flared style lash inserts for added fullness. Use a few at the corners of the eye for a subtle look or as many as you dare for super-full lashes! The Vegas Nay by Eylure Collection is a Gorgeous jewel-toned packaging enhanced with gold, a perfect reflection of her flawless profile. This collection features four 100% natural hair, lightweight lashes each with a back of pack that is individually tailored to show exactly what the lashes can do.